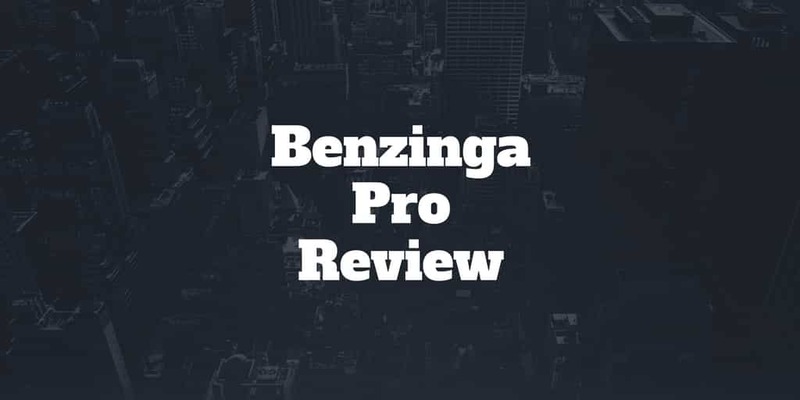 Benzinga Pro Review: Benzinga is a platform designed for self-directed investors who are looking for fast access to financial information in order to make better trading decisions. The platform has deservedly earned glowing tributes across the board from CNBC contributors to Chief Financial Officers. Benzinga is a favorite news outlet for professional traders and financial research analysts, in addition to ordinary traders seeking top notch stock market analysis. Whether you are looking for real-time news alerts, live audio squawk streams, or Benzinga wire exclusives that contain actionable information, Benzinga Pro is a one stop portal. And compared to its rivals, Benzinga is arguably the most polished and intuitive platform. Is Benzinga Right For You? Benzinga Pro is a service designed for traders. Slow-and-steady investors may find good value too but it is the speed of its breaking news service that makes Benzinga such a compelling platform for active traders. Unlike other publishers of financial information, such as The Wall Street Journal, Bloomberg and CNBC, who cater to a broader audience, Benzinga prioritizes the needs of traders. Benzinga features two plans, Basic and Essential. The Basic Plan includes watchlist alerts and newsfeed access for $99 per month if paid monthly. The Essential Plan includes full newsfeed access as well as live radio, sentiment indicators, access to chat directly with the newsdesk, and personal account management for $249 per month if paid monthly. Both plans are discounted by 20% if you choose to pay annually. 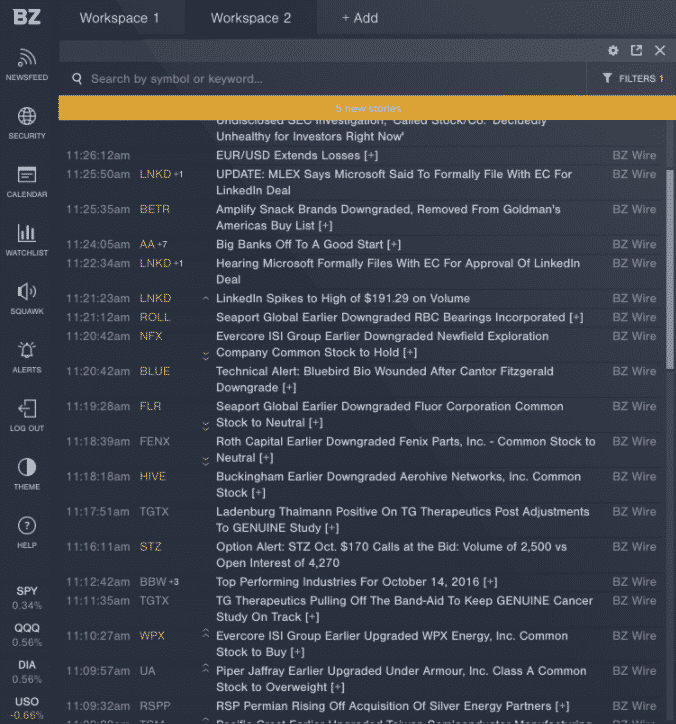 Benzinga has a dizzying array of features designed to help you better manage your trading. ✅Financial Research Platform: Whether you are looking for information about company earnings, economic data, analysts’ ratings changes, takeover bids, or activist stakes, Benzinga makes it all available in one polished dashboard view. ❌Pricing: The monthly cost of the Basic and Essential Plans are by no means cheap, however if you choose annual billing you can save as much as 20%. ✅Customized Watchlists & Alerts: You can easily create your own portfolio watchlist and set alert notifications. ❌Ads: Benzinga earns revenue from advertising so you will need to be prepared to receive ads in your inbox and on site. ✅Real-time Newsfeed: Benzinga is renowned for breaking financial news stories fast, often ahead of major financial news outlets. ❌Alternatives: MarketBeat provides extensive market coverage and is worth checking out as an alternative to Benzinga Pro. ✅Streaming Radio Feed: A primary value of Benzinga Pro is the live audio feed which spotlights major news announcements ahead of other news wire services. ✅Newsdesk Chat: Think of the newsdesk chat feature as your own virtual research team that you can call upon when you see a stock moving significantly without apparent news. ✅Intuitive Dashboard: The dashboard is polished, easy-to-use, and simple to navigate for even the least tech-savvy user. ✅Email Alerts: You can subscribe to receive email alerts relating to SEC filings and company announcements. ✅Desktop Notifications: In case you miss a newsfeed article, you can subscribe to desktop notifications that alert you to the latest news. ✅Customer Support: You can chat one-to-one with customer support agents and newsdesk representatives as an Essential Plan subscriber. You can track the following securities with Benzinga. Benzinga Pro is a platform designed for self-directed investors who are looking for fast access to financial information in order to make better trading decisions. It is renowned as one of the fastest news alert services among newswires and includes a variety of valuable trading features too, including watchlists, sentiment indicators, earnings and economic calendars, trading ideas, and market commentary. One of the most valuable services provides access to analysts on the Benzinga newsdesk. When share prices move, you can ping Benzinga personnel to identify the cause when no other news releases explain away the share price pop or drop. For the depth of information accessible at your fingertips, Benzinga Pro is priced fairly, especially when you choose an annual plan. However, you can try it out with less risk by signing up to a monthly plan.